MIND SOUP: "The Decision" has finally been made: LeBron James is joining D-Wade and CB4 in Miami! On July 8th at 9:00 PM Eastern Time, LeBron James announced on an ESPN special that he will join his fellow Olympic '08 teammates Dwayne Wade and Chris Bosh on the Miami Heat. The ESPN special, titled "The Decision", was a one hour special held in Greenwich, CT where its proceedings will go back to the Boys and Girls Clubs of Akron, Cleveland, Chicago, Miami, and New York. James and Bosh, both brought in through sign-and-trade deals with their former clubs, took a 15 million dollar discount by signing $110.1 million over 6 years. Wade took the larger discount and signed a $107.5 million over 6 years as well with clauses that they can return to being free agents in 2014 and have player options for the 2015-2016 season. LeBron James has switched his jersey number from #23 to #6 in tribute to Michael Jordan, while Chris Bosh switched from #4 to #1. Wade wanted to swap numbers as well but said that “#3 is the magical number “ as they are together and had to take sacrifices financialwise. The speculation about where LeBron would be going as been endless ever since he said in an interview in November '08 that he will not sign a contract extension with his hometown team the Cleveland Cavaliers, and will seek his options as a free agent. Many teams have attempted to sign the self-titled "King" by creating enough salary cap space to lure him and another max contract free agent. The New York Knicks, for instance, traded many of their best players for the past two years in order to pave way for “King James” to create his “kingdom” in the Mecca of Basketball. Other teams that were in the race for LeBron James were the Chicago Bulls, Los Angeles Clippers, and the New Jersey Nets. The Free Agent class of 2010, is easily the most coveted and star-struck class in the history of the NBA, if not in other sports as well. This summer also came to be known as the Summer of LeBron with all the hype surrounding the new Miami Heat superstar. Rumors came out the weekend preceding July 1, where Stephen A. Smith of ESPN reported that the trio met up at South Beach to discuss all the possibilities, and stressed on the idea of the three of them playing for Wade’s Miami Heat although it was noted that LeBron initially didn’t like the idea of leaving Cleveland, hence creating a 50-50 chance of this mini Team USA to form. Later came reports that James wanted Chris Bosh to join him at Cleveland via a sign-and-trade deal where Chris Bosh would sign with his former team, the Toronto Raptors, for max money that cannot be offered by other teams ($125 million over 6 years) and be traded to Cleveland. However, Bosh didn’t like the idea of playing in northeast Ohio, and notified James that he would play for the Miami Heat, Chicago Bulls, or the New Jersey Nets. Last Tuesday, ESPN.com reported that James would be resigning with the Cleveland Cavaliers and that Bosh and Wade would team up in Miami and try their best to lure James to join them. Later that day, it also announced that it would be having a one hour special called “The Decision”, where LeBron James would finally announce where he will be playing basketball next. Wednesday came, and Smith’s report of the trio joining forces in Miami resurfaced as ESPN.com accounted that James seemed to be leaning towards the Heat once again. Then came the long awaited hour on Thursday that millions of basketball fans, players and organizations have been waiting for. “I will be taking my talents to South Beach” and will be joining the Miami Heat, announced by James. Reactions came on both ends of the happiness scale, as the people in Miami were going crazy about the idea of having the trio of Bosh, James and Wade in one team while the Clevelanders felt betrayed by their own son, as “The Decision” is now added to their sports hall of shame in addition to others such as “The Fumble”, “The Shot”, and “The Drive”. LeBron said that he was looking for winning championships, as he noted that he could’ve signed for Cleveland for a lot more money or asked for a sign-and-trade deal. He simply wants to play with his Olympic teammates. A few hours later, Cavs’ owner Dan Gilbert posted a letter on his website describing his disappointment with James, without naming him in the letter and referring to his nicknames in quotes. He described James’ behavior as a “cowardly betrayal” and was extremely angry at the way James announced his decision by going on TV, by saying that "this was announced with a several day, narcissistic, self-promotional build-up culminating with a national TV special of his 'decision' unlike anything ever 'witnessed' in the history of sports and probably the history of entertainment.” He also personally guaranteed the Cavs’ fans that the organization would never betray them and that they would “win a championship before the self-proclaimed ‘king’ does” in capital letters. Later in the day, Gilbert also said in a phone interview to ESPN.com that James quit on his team during the second round series with Boston (after the Cavaliers were up 2-1), asking the people to see the tapes of Games 2 (where they were beaten by 32 points), 4, 5, and 6. 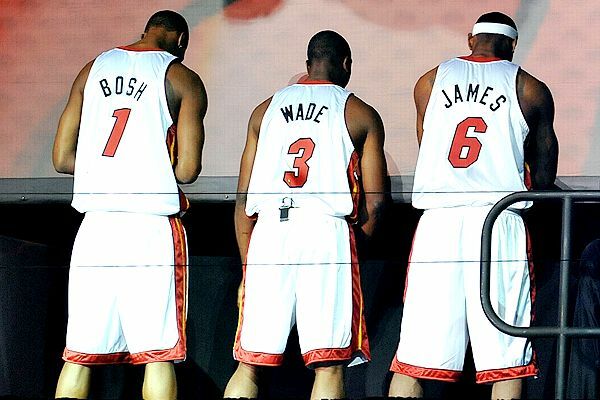 The trio joined the NBA after being drafted in the NBA Draft ’03, where James, Bosh and Wade were selected first, fourth and fifth respectively. Wade managed to win a championship in ‘06 after being partnered with Shaquille O’Neal while James and Bosh have yet to win the gold trophy. “The road to history”, James tweeted on Friday, “starts now”.